Brisket, move over. BBQ-sauced short ribs are here, ready to give you a run for your money in the tender-and-juicy slow-cooker recipe category. 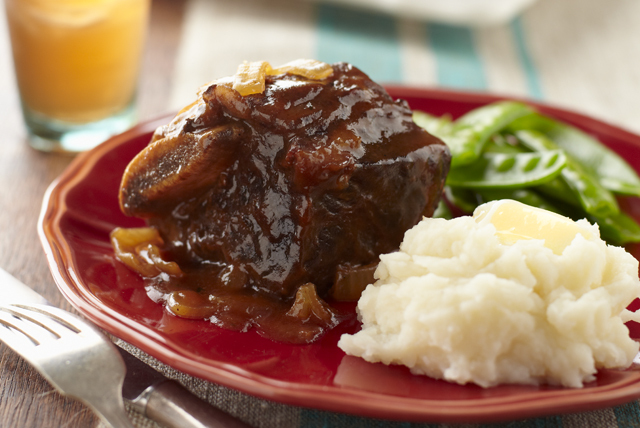 Place ribs in slow cooker; top with onions, then combined remaining ingredients. Cover with lid. Cook on LOW 6 to 8 hours (or on HIGH 3 to 4 hours). Remove ribs from slow cooker; cover to keep warm. Skim excess fat from sauce; return ribs to sauce. Stir gently until evenly coated. Serve with 1/2 cup of mashed potatoes and 1/2 cup of sautéed vegetables to round out the meal. Meats cooked in a slow cooker make great leftovers. Cover and refrigerate any leftover meat in the leftover sauce. When ready to reheat, remove and discard any fat from surface of sauce. Cook ribs and sauce in saucepan on medium-low heat until heated through, stirring frequently. For easy cleanup, line slow cooker with plastic liner bag before filling with ingredients and cooking as directed.